HALO Security provides monitored security solutions from Alarm.com, Honeywell, DSC, 2GIG and other major manufacturers. Based in Maryland, we are committed to protecting your personnel, assets and business’ personal information. We treat your business with the same care and attention to safety as we do our own. Keep an eye on what matters most with HALO Security video surveillance solutions from Alarm.com. Whether you’re looking to secure your stockroom or just keep an eye on things when you’re not there, HALO Security has you covered. Never miss any detail by upgrading to digital cameras with sharp HD quality. Monitor your operations to make sure your employees and customers are always honest and safe. Ensure a safe working environment for employees, and keep a lookout for thieves when you aren’t there. Keep your business secure and connected with access control from HALO Security. Brivo access control allows you to monitor, manage and control your facilities remotely in real-time. 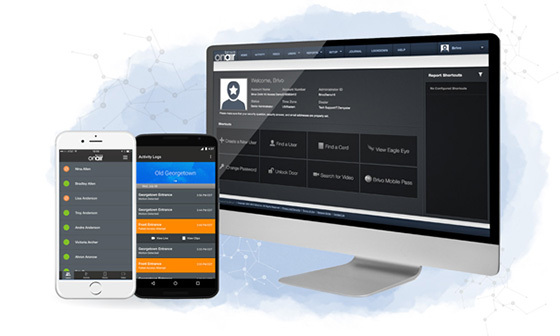 HALO Security offers a full suite of interactive commercial services designed to support a wide range of small to medium sized-businesses, from single properties to multi-location enterprises. With just an Internet connection, both small and large businesses can manage their business operation with Brivo’s cloud-based interface. Keep your business secure, gain new awareness and instant visibility into key operational activities, and manage your energy costs - no matter where you are.